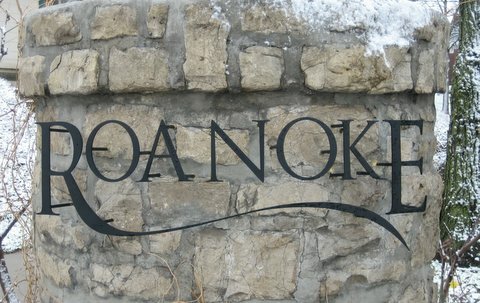 Roanoke is a quaint urban neighborhood that sits west of Southwest Trafficway between 39th and 36th streets and runs west to Roanoke road. The Roanoke neighborhood was established at the turn of the century when the Roanoke Investment company bought 188 acres from the Kansas City Interstate Fair in 1887. Between 1900 and 1910 forty houses were built by many of Kansas City’s prominent families including the Muehlebach’s, Volker’s and Benton’s and designed by many well known architects including Frank Lloyd Wright, Nelle Peters, and Henry Holt. These owners and their designers built homes in the styles popular in the late 19th and early 20th centuries. They valued the wooded nature of the properties, and accommodated the buildings to the natural terrain. Roanoke’s most famous resident was Thomas Hart Benton, (April 15, 1889-January 19, 1975), the famous painter and muralist. In 1977 his 2 1/2 story late Victorian residence and carriage house studio was designated by Missouri as the Thomas Hart Benton House and Studio State Historic Site. The historic site has been preserved nearly unchanged from the time of his death. Clothing, furniture, and paint brushes are still in place along with 13 original works of art on display in the house museum. Just west of Roanoke road is Roanoke Park which is between Valentine road and East Roanoke Drive. A little unknown history about the park is there is a cave located near the tennis courts that has been sealed off with a stone wall. There is very little reference information available about the history of the cave, it’s size or when it was sealed. According to people that lived in the area in the 1940-1950 timeframe, there were some children lost in the cave and these events were recorded in the Kansas City Star/Times (however these articles have not yet been located and there is no authoritative confirmation that these events occurred). It is thought the cave was sealed off around 1957. Also in the park is the that offers a workout center, pottery room, and reception area, great for meetings, wedding receptions, birthday parties, dinner parties and so much more. Today as you wander the winding roads of Roanoke you can imagine how the neighborhood looked in earlier times. Many homes are a century old and some trees even older. Beginning as a suburb, the Roanoke neighborhood now serves as a model for urban living.